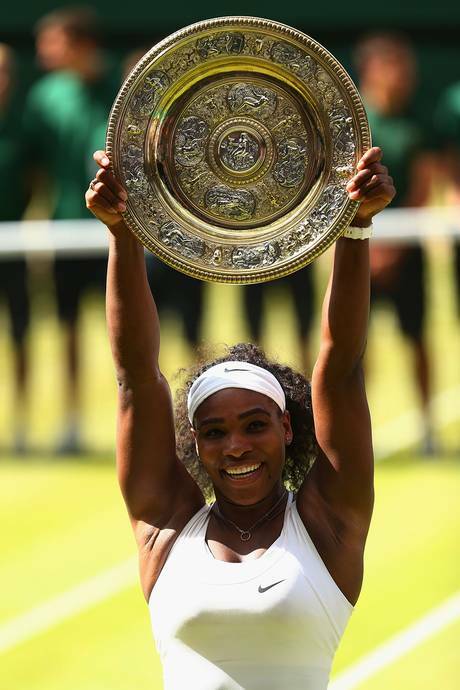 Serena Williams won a sixth Wimbledon title on Saturday as the world number one became the oldest woman to win a Grand Slam crown with a 6-4, 6-4 victory against Garbine Muguruza in Saturday’s final. Serena‘s sixth Wimbledon crown brought with it a slew of other remarkable landmarks that underline her credentials as one of the greatest female athletes of all time. But it is her legacy rather than her bank balance that concerns Williams these days and she now holds all four Grand Slam titles at the same time — the rare ‘Serena Slam’ she last achieved in 2002-03. Given Serena‘s 39-1 record in 2015 and her astonishing streak of 28 consecutive Grand Slam match victories, few would bet against the American making more history in New York in August. And with the pressure ratcheted up, the inevitable Serenabreak back arrived in the eighth game when Muguruza missed with a wild forehand.